In my preview, you may have noticed that I was a bit concerned by Catania’s form this season. They are a tough team and have split the points with 5 opponents as well as having beaten Napoli last week. So I was hoping that not only would we score early and often, but avoid conceding a goal at all costs. And Milan did not disappoint. Love it when you score, Zambrotta! The first half saw my fears reduced quickly as Lanzafame took Robinho down in the box for a yellow card and a penalty. Ibra stepped up and took it for the goal, 1-0 Milan. Like the gentleman that he is, Ambrosini earned himself a yellow card just 2 minutes later on a nasty foul on Gomez, or maybe it was to reward Gomez for the dangerous shot one minute earlier. Either way, 10 minutes down, even on yellows but Milan up by a goal. I’ll take it. Catania may tell you they were robbed of a handball in the box by Zambrotta in the 12th minute, but the ref got this one right. Zambrotta was turned away from the ball, his arm pulled in close, it was the ball that hit him, not vice versa. Abate took a knock in the 17th that looked dangerous. Mainly because he’s pretty tough, and he rarely stays down for anything. But of course, he played the rest of the game, and well, I might add. In the 21st, Aquilani put a sweet cross in that Ibra just didn’t get to, but that didn’t matter, because Robinho made up for it in the 24th with a goal from a crazy angle. 2-0 Milan. Andujar came back from that with a great save from a Seedorf shot in the 25th, only for Abbiati to show him how it’s done vs. Gomez at the other end in the 27th. My favorite celebration for a stellar performance... my hero! In addition to the many shots that were just wide or maybe sent into the stands from both sides, there were a lot of great saves, too. In the 38th, for example, there was a great shot from distance by Aquilani, and it looked like Andujhar just got a fingertip on it to tip it over the crossbar. Or one of the most spectacular saves when Ambrosini shot a header at close range and Andujar blocked it off the line with his body in the 43rd. Things got really interesting when Abbiati was injured in the 44th by a pair of dirty cleats that were literally ground into his forearm. And while this was happening, the ball went back out for a shot that was saved by…. Bonera! Yes, the same Bonera that was a bit dazed after having bumped heads in the 39th. The same Bonera who was given a yellow card for a brilliantly faked “foul” by Gomez in the 1st minute of stoppage time at the half. In the 69th, there was a goal. My feed gave it to Seedorf, another source says it was a Lodi own goal. Personally, I think it belonged to Robinho, who took a nice pass from Ibra to slot it in toward goal. But the most important fact is: it was a goal. 3-0 Milan. The one that put the game away. Tensions ran high, and Abate and Barrientos were both shown a yellow after a bit of contact in the 71st. Milan were awarded a free kick in the 72nd which Aquilani sent in to Andujar, who punched it right back out… into the run of Zambrotta, who easily scored the goal over the downed Andujar. 4-0 Milan. Every opportunity counts to you, that's why I love you, Pippo! After a fantastic performance, Robinho was subbed off for … none other than Super Pippo!!! (And the crowd goes wild… literally!!) Oh, and Delvecchio came in for Lodi and Antonini replaced a tired Seedorf, all in the 79th. In stoppage time, Ibra earned himself a yellow for a silly foul, but the game ended on a high note with Abbiati having yet another nice save on a shot by Bergessio just before the whistle. All in all, we really dodged this Argentinian flavored bullet. We may have had 22 shots, 10 on goal, but we allowed Catania to take 16 shots, even if there were only 5 on goal. We maintained 56% possession, but needed more to keep Abbiati from being so busy in the back. Don’t get me wrong, it was not by accident that we sealed a 4-0 victory to give Catania only their second loss of the season. 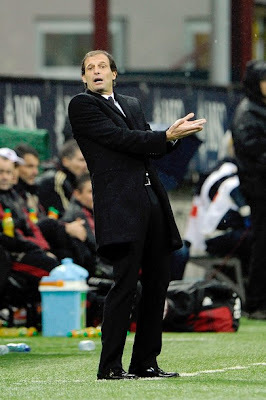 This was surely by design, Allegri being the master planner. With injury and suspension concerns, he did very well to field a team that could pull off the win. And he gave Inzaghi more than 10 minutes. Okay, even if it was only 11, I was starting to worry they had locked him up somewhere and thrown away the key. We were so lucky not only to play our match, but to not have the very sad casualties that the people of Genova had. It seems the minute of silence before the match is happening too often, too much tragedy. My heart goes out to all affected by the intense flooding in Italy. "You pray to your God, I'll pray to mine." 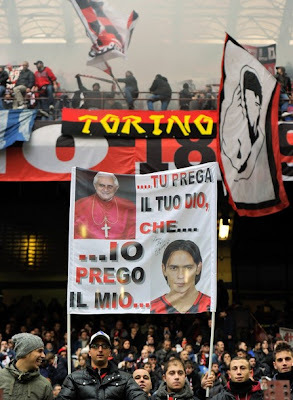 And yet, I am also happy for a 4-0 win AND a Pippo sighting to go into the international break. A great way to honor the recovering Cassano, and absolutely worth the 6 am starting time for me here. A bullet dodged, and most importantly a clean sheet with 4 goals to rack up a goal differential that we need to climb the table. Grazie, Milan!